The latest in our projects and machinery additions. The world of metals is a wide-ranging, complicated place. With our “Materials Focus” series, we aim to shed some light on different materials that we commonly use. Some of the topics we’ll be covering in our “Materials Focus” series include general elemental components of popular alloys, strengths and weaknesses, common uses, and photographs of parts we’ve made. This week’s material is, Copper. Copper is a material that has been used by many different societies across the world, for centuries. It is a natural metal that traces of can be found in a native form, (actual chunks of pure copper) but is most commonly found mixed with other elements. Original uses of copper can be traced all the way back to ancient China, and parts of the Middle East. However, what makes copper such a common commodity today is its malleability, and its high conductibility for heat and electricity, making it a widely used material in the HVAC and building industries. Pure copper is very expensive, and is unfortunately a common target in HVAC related thefts, that are turned around and sold to unknowing scrap companies. There are numerous amounts of copper alloys, and even some secondary processes that aim at making copper products more affordable and usable. The list of copper alloys is quite extensive. So much so that common metal names such as bronze, and brass are actually both copper alloys. Thus, all bronze and brass alloys are still really alloys of copper. Adding the alloys that are made with combining precious metals gold and silver, the list is too long to go into great detail for this blog. To keep things relatively simple, yet informative, the main difference in brass and bronze is what is mixed in with the copper. Brass is primarily a mix of copper and zinc, whereas bronze is a mix of copper and typically tin, but can also be aluminum or silicon. As you get into the alloys of each respective material, there are additional metals that enter the mix, but the zinc and tin/aluminum/silicon are the commonly present mixtures that make each alloy. While the alloys have different contents and uses, the price of each doesn’t necessarily drop dramatically and they still have a high malleability compared to steel. So how does one go about making mass quantities of copper parts without breaking the bank, and getting the rigidness of steel? This is where a process referred to as “copper clad” comes into play. Copper clad material is a bi-metal product that is made primarily of regular steel, with a coating of copper on top and at the bottom of the steel. 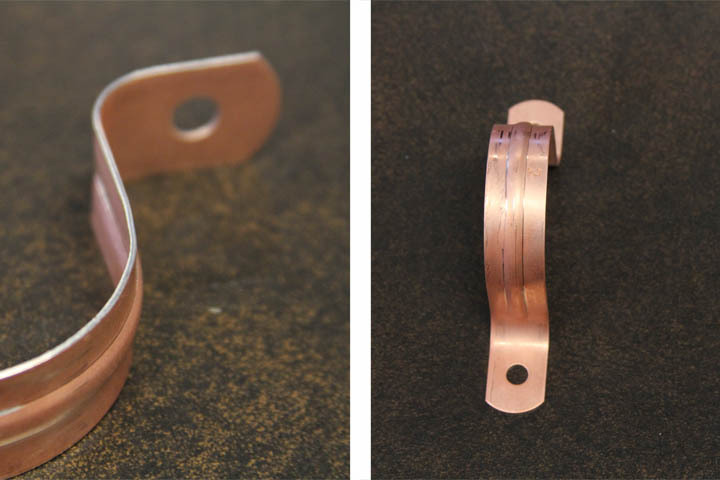 Copper clad material has greatly benefited the wire, electrical, and plumbing industries because of its capability to posses the conductivity of copper, yet at the same time still have the tensile strength of steel. While copper clad material does come with a lower price tag of a similar, pure copper product would, it is still significantly higher than regular steel. Here’s an example of a Copper Clad Pipe Strap. The right side of the photo shows the copper material on top, whereas the left side of the picture shows the bit of steel showing through where the material is cut. The steel allows for the standard rigidity of our pipe straps, but the copper clad allows them to be used with copper piping. In our world, copper clad pipe straps are required when copper piping comes into play. Regular steel pipe straps would eventually erode copper piping, however with copper clad products, plumbers and electricians are capable of keeping the rigidity of steel for the main body and putting copper to copper eliminating any material issues that would arise. We hope this month long series on materials has been helpful for you to understand the different uses of the materials we commonly use. Feel free to leave any unanswered questions below in the comments section. Next week, we’ll start to dive into the world of production dies. We’ll discuss the different styles of dies, along with different components that are required to run dies as efficiently as possible. This entry was posted in Materials on January 29, 2014 by johnatmetalproducts.